You are currently browsing the tag archive for the ‘bookcrossing’ tag. 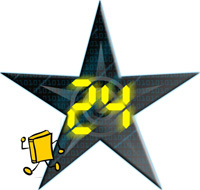 Yay, after two-and-a-half years I’m finally participating again in the 24 hour read-a-thon! And I’ve been extremely looking forward to it. :) It was rather difficult to keep the date free since so many activities seem to be planned this weekend, but I was firm and only have a birthday to go to later on. That’s also why I allowed myself to start an hour earlier than the set time for my zone here in Utrecht: at 13.00 instead of 14.00. And I already know I won’t be reading around the clock but that’s okay: today is meant to get some reading done and I NEED that because I’ve been in some kind of slump and I got this Bookcrossing bookray that I want to get on with – The Book of Negroes by Lawrence Hill (Het negerboek in Dutch). The bookmark you see I cut from a thank-you note card that was sent to me by a swap-bot member. Cute, isn’t it? That’s a quote by Rudyard Kipling, the author of Jungle Book (who used to be accused of racism but got revalued later on). I also won’t be blogging, tweeting, FB-ing much today, nor participate in (many) challenges or lose myself otherwise in social media. I may post an occasional update but for me today is meant for reading even though I know the readathon is much about the community as well. A grrl has to set priorities! Why don’t you follow my example and pick up a book? I haven’t participated in the last read-a-thon (as I said at the beginning) but I know from previous ones that social media are majorly distracting! I’ve got some fun bookish things to share from the past week. 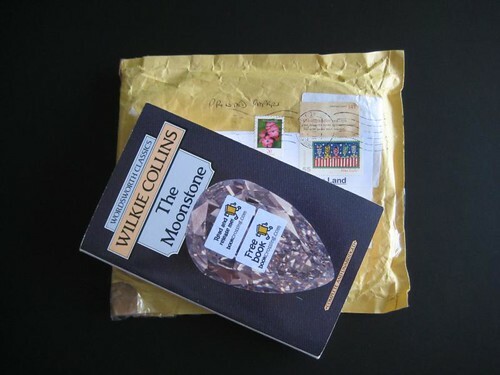 First of all I received a RABCK from ApoloniaX in Germany: The Moonstone by Wilkie Collins. Did you know it is the prototype of the modern detective story in the English language? I also worked some more on Graasland: I added my list of books read in 2001 and published my review of The Grapes of Wrath by John Steinbeck. The classic is now on its way to another reader in the UK. Me, I’m off to the suburbs for another release in Bookcrossing Monopoly. Sounds like I’m having a good time, right? I forgot about statistics on authors new to me: 22 of 34! Yesterday I finally finished reviewing my best read of 2009: The Grapes of Wrath by John Steinbeck. That is such a relief! Post scheduled for later this week. One of the things you’ll be able to find on the Gnoegle map is team De Boekenleggers’ release in week 10 of Bookcrossing Convention Monopoly. Search for Een echte Lizzie kerst (A Real Lizzie X-Mas) on page 2. It was hung in a real life Christmastree and happened to be the 200th release of the game! Which reminds me of some other Bookcrossing related activities I participated in last year, that haven’t been mentioned yet on this blog. The SIY (Set It Yourself) Challenge: 7th edition (January-March; failed) and 10th edition (October-December). I participated in the 2nd and 6th editions of 2007. Being in the mood for archiving I also added two posts to Graasland about books read in 2005 en 2006. And I have updated my profile on the Bookcrossing bookshelf. Such a lot of maintenance I got done! HOORAY! So, how was your week??? Well, obviously this week was dominated by Dewey’s 24 hour read-a-thon. You can’t have missed it! Not only if you’re a visitor of Graasland: we also made it a trending topic on Twiter. Yay! I had a lot of fun, but it was much more difficult than I had expected. From the total of 24 hours I’ve slept six and a half — the rest was spent on the event (except for some eating and stuff). Because of that my totals seem a bit meager! Read more about what I read and what I found hard about the read-a-thon in my last progress update and the ‘End of the Event Meme‘. The Feed Me Seymour! mini challenge at Linus’s Blanket (hour 9); my favourite! Was there no other bookish stuff going on this week, you ask? Of course! I finished Be With You (Takuji Okigawa) just before the read-a-thon started. I absolutely loved it! I will be adding it to my Japanese Literature Challenge so you might look forward to a review. And I bought another book (thinking I could read the novella during the read-a-thon, dôh): Silk, by Alessandro Baricco, in Dutch: Zijde. Unfortunately the book cover is not original but shows the movie poster… I don’t like it when publishers do that! I do not plan to see the film; here’s what Mee wrote about it. And last but not least: our Bookcrossing Monopoly mission was ‘restaurant’, so De Boekenleggers released a Dutch copy of Como Agua Para Chocolate (Rode Rozen en Tortilla’s) at the moped of a Mexican Delivery Boy. 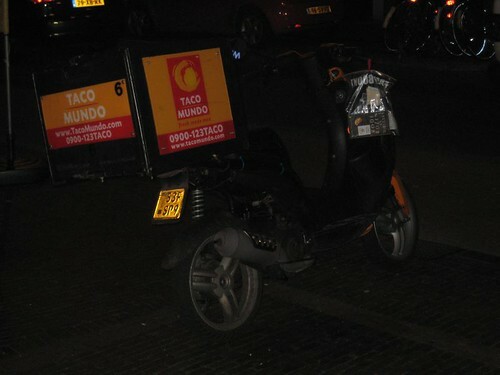 Have you seen it crossing Utrecht city? We know it has been caught, but unfortunately there’s no journal entry yet! This is very exciting: on Wednesday the Monopoly 2.0 release game got started! My teammate myranya and I are called De boekenleggers, which can be translated into bookmarks — but it is a better name in Dutch because it is literally ‘the book layers’ (people laying books). Our first assignment is to leave a book at an IKEA shop… This is my 2nd time playing Bookcrossing monopoly and it was great fun last year! There’s just one title I would like to add: Zijde (Silk), by Alessandro Baricco. So if anyone has got a copy available, in Dutch or English..? 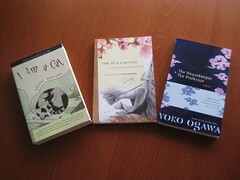 My mailbox really had to work overtime this week: I also received my three online Japanese book group reads yesterday! Next week I hope to have finished John Steinbeck’s The Grapes of Wrath… I’ll see you then! Anyway, it is a GREAT surprise that I have won the monthly readathon prize! 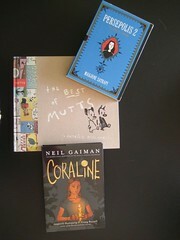 I’ll keep an anxious eye on my mailbox to see what wishlist book chucklethescot has sent me! What I liked best about the readathon is that I used any free minute to try and read. I started fresh with Revolutionary Road and finished it in only a few days! After that I picked up a book fitting Banned Books Week (The Grapes of Wrath by Steinbeck) and I got 1/5th read of it already. Sometimes it takes me a while to get into a book because I read too little, but I had no problem with that now ;) Both books by Steinbeck and Yates are part of this years Classics Challenge (among others), so the readathon also gave me quite a push ahead at that! On the other hand… what I liked less about the readathon is that I didn’t get to do other stuff, like review books (or take enough time to think them over) or make bento’s for lunch. That gave me a feeling of being behind… But it was only for a week and I’ll be able to catch up now! But it is something to consider next time I join in. More good news is that I (started and) finished a book during the readathon: Revolutionary Road, by Richard Yates. And it was a great read!!! You’ll have to wait a while for a review because first I’ve got to try my hand at To Kill a Mockingbird. Now I have started reading another classic: The Grapes of Wrath, by John Steinbeck. I picked this one because it is part of my personal and Classics challenge and this week it is Banned Book Week in which Americans celebrate the freedom to read. They have been doing so since 1982, in response to a sudden surge in the number of challenges to books in schools, bookstores and libraries. Steinbeck is #3 on the list of banned and challenged classics. #1 (The Great Gatsby) I read in 2006, #2 (The Catcher in the Rye) I have tried sometime and put away again. The Grapes of Wrath was burned (!) in its year of publishing by the East St. Louis, III Public Library and as late as 1993 it was challenged in the Union City Tenn. High School classes (read more?). Well, it is too early for me to have any opinion on the book but I am against censorship no matter what. Let’s see what my end total will be tomorrow!